The Destructoy Mouse is an Event Mouse found during the annual Great Winter Hunt event. This mouse is a prime example of how the villainous mice of Gnawnia can turn even the most fun-filled items into instruments of destruction! Don't let the playful look of this mouse fool you; it will rob you of your cheese and pillage your trap the second you turn your back! Information on how to locate and capture the Destructoy Mouse can be found on the current Great Winter Hunt location page. 2 December 2011: The Destructoy Mouse was painted live during an 'All about the art' Feedback Friday. Ideas and suggestions for how the mouse should look were provided by the audience at the time of painting. 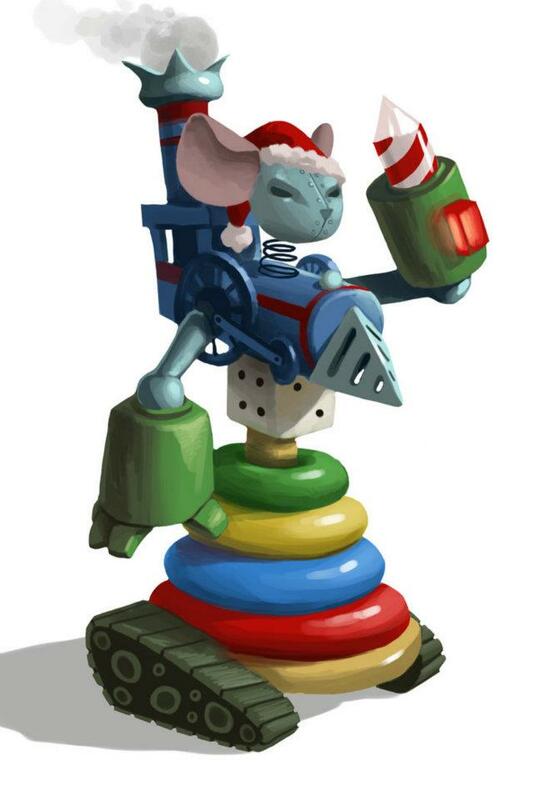 7 December 2011: The Destructoy Mouse was released as part of the Great Winter Hunt 2011. 13 December 2016: The points/gold for Destructoy Mouse were changed.